It’s 5:53 AM as I walk into the office for another great day. Walking through the door, a few employees from 3rd shift were around one of the lines in intense discussion. Great, the line is down. As I’m walking toward them, one of them is waving their hands, pointing, as if playing charades. I glance down the line to see what they are talking about. As I continue walking toward them, they both stop, looking around, look back at the line and keep talking. Upon arrival, they start telling me all about the evening that has led to this point. After 2 minutes, I could tell this conversation was going to take a little longer. I asked them if they would mind if I set my items in the office and be back in 2 to 3 minutes. They both shrug, a little surprised, and said sure. As I walked to my office, I sensed there was something else on their minds. These two typically didn’t let something specifically stop the line, let alone for a few hours. I grabbed my coffee and poured two additional cups. As I arrived, both employees looked up, noticed the coffee and said “thanks.” I asked for the download of what was going on. As they elaborated on the details, I could see there was frustration in the tone of voice with one of them. When they finished running through the details, I asked if there was something else going on. As one quickly said no, the other started to say something. He paused, looked at the other a little embarrassed. Although we all could see there was something there, we had a task at hand. We discussed the line down further, walked the line, identified and fixed the problem. Once finished I asked both to come to my office. I needed to understand what else was going on. I could have let it go, yet I knew if I didn’t there could be some other unintended consequence if it continued to fester. I asked what was really going on. One of the guys started to elaborate on some family issues that have been boiling up and last night was a tipping point. Over the course of the conversation, I realized this employee was looking for a friend, someone he could lean on and if needed, would offer unbiased advice. As we finished our conversation, mentoring, and a few moments of awkward silence, the employee said: Thanks, there’s been on my mind a lot, and I guess it got in the way of work tonight. As he turned to walk out, he asked: “Hey boss, a few of us are grabbing a drink on Friday, would you like to join us”? I froze. Have you seen managers struggle with this? “Why?” Their peers, former colleagues, and friends are now their employees. They had great times with those employees outside of work. Those after work relationships (bowling, golf, tennis, soccer, poker, gardening, etc.) developed into some great friendships. They don’t want to let their friendship dwindle away. Too frequently, those friendships would govern the decision-making process. In many cases, the decisions seem harmless. However, over time, it’s hard to reign in employees once those decisions take place. It leads to some ugly conversations, which are typically around performance/attendance issues. You now have to course correct, and the fallout can be substantial. If you don’t address these matters, your career may be on the line. “Is it hard to balance the relationships”? You bet! Employees want some level of appreciation beyond the job that they matter to the company. Why is this important? We spend more time with our work family than we do with our families. When you take the extra moments to genuinely express an interest with employees, their productivity increases, their job satisfaction increase, they have a more positive outlook and will support you. While some of these ideas are bouncing around in your head like, oh really, this will never work for me. I’ve tried that before, and that didn’t end well, or I do that it today and everything seems to be working out… think about how a relationship like this would make you feel if you had it with your boss. How do you balance the employee expectations and business expectations, and be yourself in the process? 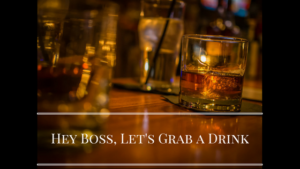 Have you seen instances where the boss is also invited to their employee’s family gatherings (birthdays, anniversaries, etc..). A few of you just cringed. Does this work for everyone? Absolutely Not! To do this well, you need to set clear boundaries/expectations consistently and communicate those expectations. The moment you stop sticking to those boundaries, issues will occur. Once the snow ball rolls down the mountain, it’s a matter of time before a avalanche of problems has buried you. When I’ve had a relationship like this, I honestly was more productive, had a greater sense the work I did mattered. I did, however, have to watch myself like a hawk. If you don’t, you will cross the employee/friend line, which does create a strain on the relationship. On the other hand, I’ve also experienced having a boss that did not interact as a friend with the employees. Let’s just say; it was a job at that point. We have defined roles and responsibilities, punch the clock, perform the job, punch the clock, go home and repeat every day. You must keep conversation lines open with everyone. The last thing you want is to tackle the rumor/gossip mill. Typically this happens when other employees see their peers, or others, frequently chatting with the boss. When you regularly communicate, having an open and inclusive environment the volume of gossip is minimal. Trust from the employees also grows.